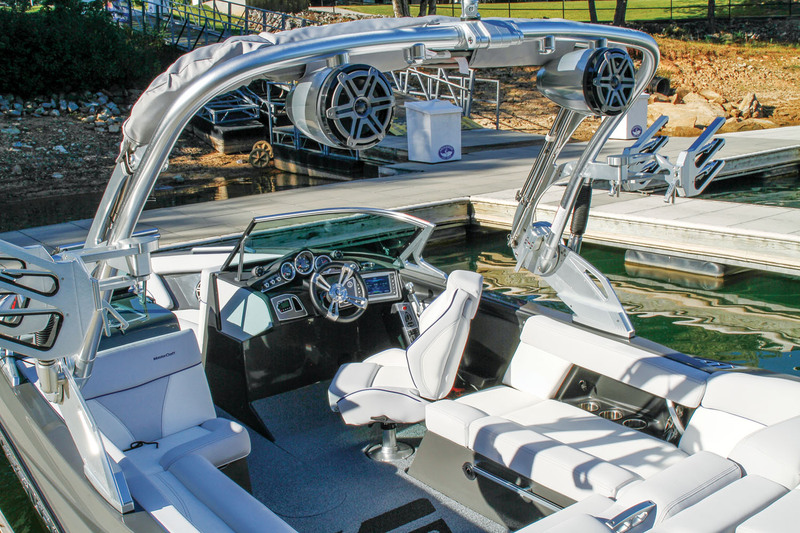 The new crossover from MasterCraft manages to hit the mark on many levels. Last year, MasterCraft unveiled its all-new XT series with the XT22, a crossover boat capable of handling any watersports mission with aplomb but at a price more buyers could afford. For 2017, the XT lineup expands with the addition of the XT23, which features the new styling scheme and some innovations that will make mainstream boaters who are avid skiers consider switching to this new breed of pure watersports boat. It replaces the popular X30 in the lineup, but there’s no doubt it’s a step forward. 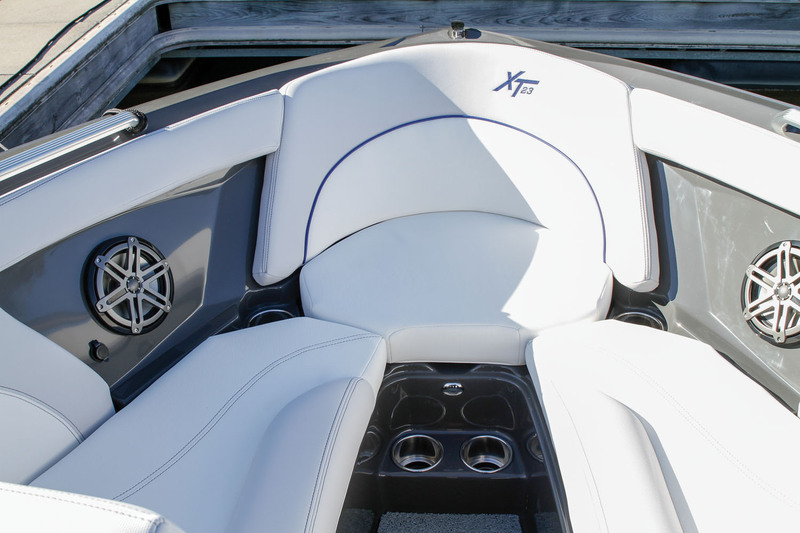 With the expansion of the XT line — which includes a 20- and a 21-footer in addition to the 23-foot, 3-inch crossover flagship XT23 — MasterCraft now fully covers the spectrum of price ranges. The entry-level NXT series gets owners into the MasterCraft family for as little as $59,590, and the X series pushes the luxury bounds beyond the reach of many potential owners, as evidenced by the X26’s starting price of $150,790. The XT23 splits the difference while delivering some of MasterCraft’s best features, for a starting price of $101,190. The new styling scheme starts on the hull’s sculpted sides and new hipline, giving it a 3-D look that makes the colors really pop, especially the optional metal-flake gelcoat our test boat featured (starts at $1,100). The 2017 version of the ZF4 Tower ($9,460) includes some new styling changes and new options such as the vertical surfboard rack ($1,860). But the best innovations are the new tow points in the corners of the tower. Called Surf Knobs, they help entry-level surfers by placing them right in the surf wake’s sweet spot from the get-go, so they don’t have to surf down the face of the emerging wave to get in the pocket. The stout tower has release levers, instead of knobs, and gas-assisted struts to make lowering the tower a one-person job. We tested the XT23 with Ilmor’s new-generation engine — the first ski-boat engine to achieve the California Air Resources Board’s (CARB) Five-Star rating, identifying it as Level Five Extremely Clean Emission engine. It reaches this standard thanks to a new catalytic converter, a Thermal Command Center and a more advanced fuel-injection system called GDI that’s part of GM’s newest Gen-5 engines. In addition, with the sale of each new engine, Ilmor will plant three trees to further reduce its carbon footprint. This engine won the coveted NMMA Innovation Award at this year’s Miami Boat Show, partially for its low emissions, but also because users can change the water-pump impeller in less than a minute and reset fuses on the standard Murphy Touch Screen display at the dash. 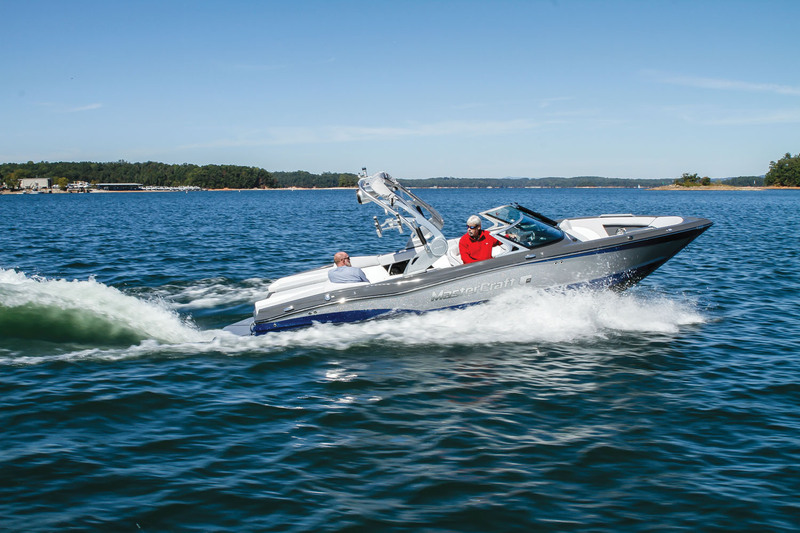 The model we tested was the 5500 GDI, which uses a smallish 5.3L block to produce 365 hp and 410 foot-pounds of torque, which helped the boat achieve snappy out-of-the-hole performance. Also helping the XT23 out of the hole was the Auto Launch feature on the optional Attitude Adjustment Plate ($1,090), a center tab that deploys down but retracts after the boat is on plane, to keep drag to a minimum. With it, the XT23 got on plane in 2.8 seconds with negligible bowrise. Time to 25 mph was 5.8 seconds, brisk considering the boat weighs 5,000 pounds without ballast or passengers, up to 16 of them. Speed peaked at 40.2 mph. Usually, a discussion about ski-boat handling during docking maneuvers goes something like this: “You can easily pull up to a dock, provided it’s on your starboard side — and forget backing in a straight line.” This year, MasterCraft got a leg up on the ski-boat industry with its new Dock Star system, which also won an NMMA Innovation Award. 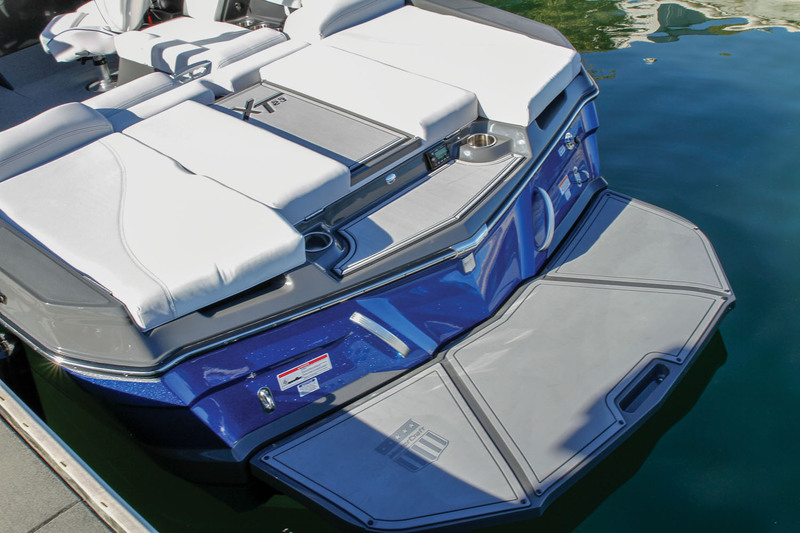 MasterCraft uses two rudders in front of the prop that work in concert with the main rudder behind the prop to allow unprecedented maneuvering, whether docking or towing. 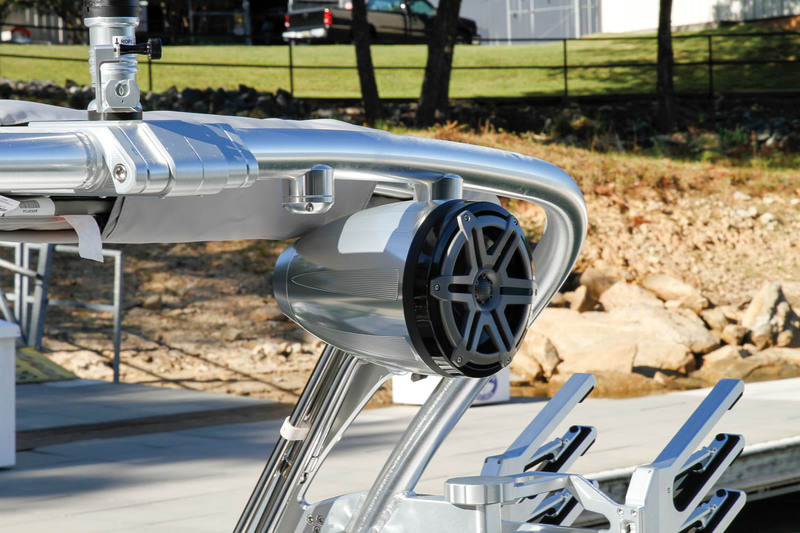 Dock Star is included as part of the Sport Handling Package ($4,760), which includes three tracking fins and the Attitude Adjustment plate. The tracking fins gave the XT23 tremendous grip during hard corners. If it’s a watersport, this boat can handle it. Most wake/surfboats are specially designed for one task: plowing up the largest wakes possible. Unfortunately, such focus leaves slalom skiers up in the air … literally, as they slash across watery speed bumps. MasterCraft’s new XT hull reacts differently, depending on the speed of the boat. When it’s cruising at 32 mph and faster, the wake dissipates and allows slalom skiers to get their cuts on. Giving the center Attitude Adjustment plate a bump puts the bow down a little, which further mitigates wake height. The XT23 throws a clean wakeboard wake at around 21 mph, especially when it’s tankered up with the max ballast of 2,600 pounds in its forward hard tank and rear sacks. 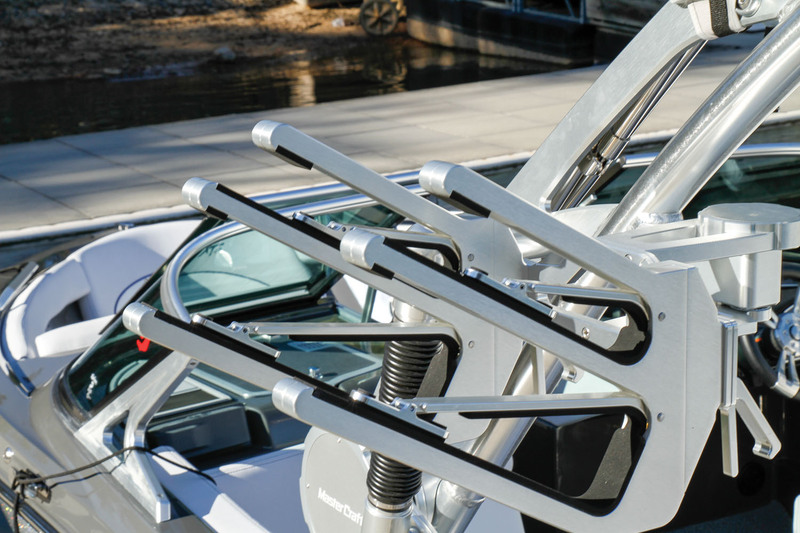 The Gen 2 Surf System uses specially shaped tabs custom designed just for this boat to create waves that range from 5 feet long to up to 20 feet long with different levels of steepness. Such versatility accommodates the full range of surfers. On our test boat, the starboard wave seemed a bit cleaner than the one to port, but with more time aboard, that should be tweakable. 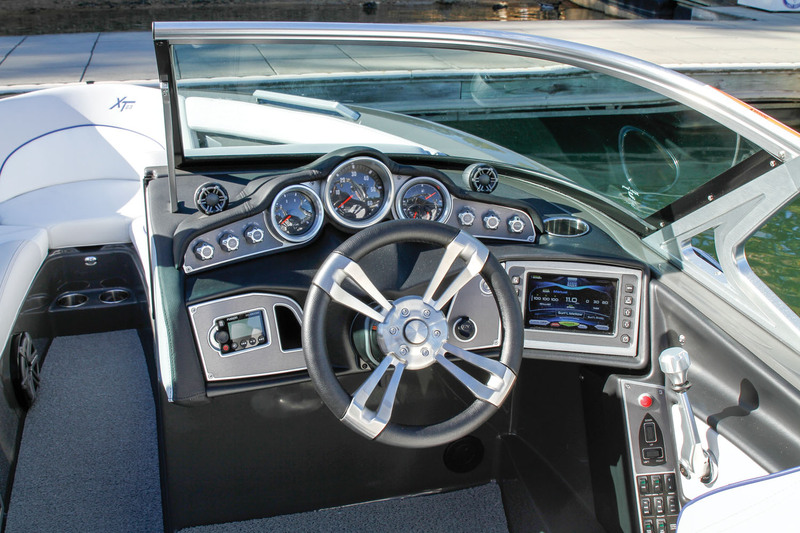 XT series boats have hulls and caps that are specially designed to maximize interior space. The XT23 has a capacity of 16 passengers, many of whom can be accommodated in the cockpit’s U-shaped lounge. In the stern bench sectional, cutaways in the corner create great passenger alcoves but don’t kill sunpad space. Even though it has the more traditional pointy bow, it’s a bit wider up front than most others and has a comfortable rear-facing seat in the front. Add the filler cushion ($630) and three people can stretch out up front. The first box that should be checked on the options list is the Cool Feel vinyl ($1,590), which greatly reduces the temperature of the upholstery, even in direct sunlight. Our test boat had it, and even the small black accent sections remained cool. Another must-have is the convertible rear seat ($1,430), which provides a front-row view of the ski show. The standard engine is the 320 hp Ilmor 5.7L 5000 MPI model, but the $6,340 upcharge to get the new-gen 365 hp 5500 GDI engine, with reduced emissions and incredibly easy serviceability, is money well spent. The next bump is to the flagship of the GDI family, the 6000 GDI, which produces 430 hp and an impressive 479 foot-pounds of torque and costs $6,890 more than the 5500 GDI. It’s the choice for hauling lots of people regularly. The apex predator is the 522 hp 7.4L engine — its GM ancestor was originally in the 1970 Chevelle SS 455 — which comes at a whopping $20,940 over the standard engine. The newly-designed helm comes well equipped, as is, with standard features such as the Murphy Touch Screen and Zero Off GPS cruise control, but it isn’t a proper ski boat without a killer stereo, and the Premium Audio and Touch Screen does the trick for $6,900. That upgrade includes a Fusion Bluetooth stereo with its own control screen, JL Audio’s top-of-the-line M-series speakers, one subwoofer for the cockpit and a rare bow subwoofer. Purchased at WaterSports Central, Buford, Ga.
We have all the features we could ever want. Over the years, we’ve had mostly outboard-powered boats until we got the MasterCraft X25 in 2013. While that was a great boat, the XT23 for us is a real upgrade in lots of respects. 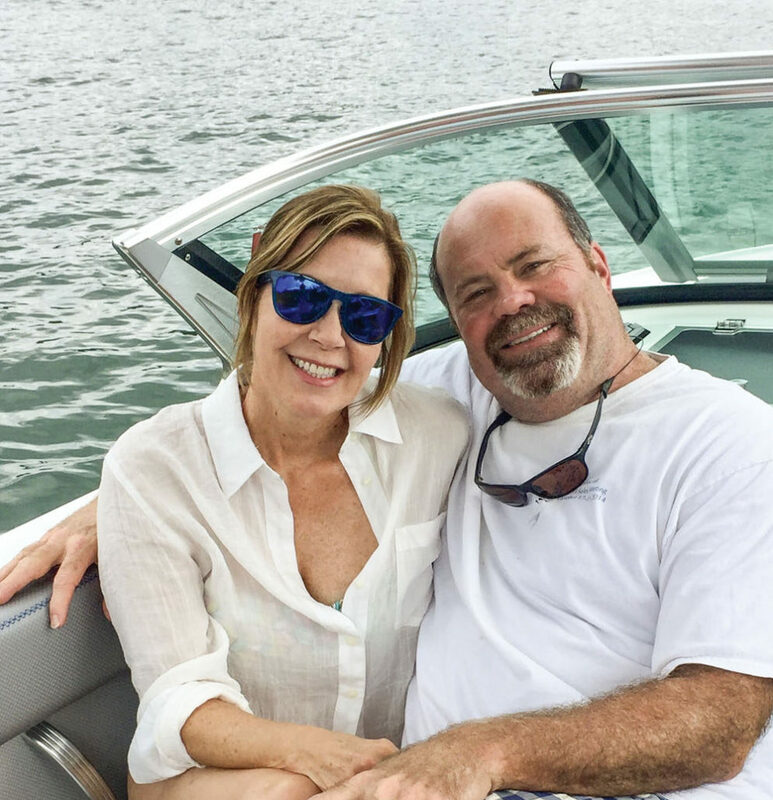 We have a house on Lake Burton, north of Atlanta, and my kids and their friends are into surfing, wakeboarding and tubing, so I tend to do a lot of the chauffeuring. The first thing I noticed was the much improved Bluetooth stereo, especially for the driver, since there are speakers on the dash. The surf wake is better in terms of height and mass, the tanks are quicker to fill, and it’s easier to control with the new touchscreen display. The new Dock Star system makes docking much easier. The pointy bow of the X23 handles rough water better. When we aren’t skiing, we go to The Waterfall Club or LaPrade’s, where sometimes you’ll see local resident Alan Jackson pick up a guitar and play with the local band. WaterSports Central’s follow-up after the sale was fantastic and their service department is great. We’re about an hour away and don’t have a trailer, but they are Johnny-on-the-spot whenever we need something. LOA: 23 ft., 3 in.